Construction market will increase or remain flat! The market size of construction industry in Japan is about 54 trillion yen(about 540 bullion dollars). The five biggest construction comapnies account for 15% of this market. Some major construction companies are proactive in using IT and overseas expansion. The market size of construction industry in Japan is about 54 trillion yen(about 540 billion dollars) according to the report of Ministry of Land, Infrastructure and Transport in 2017. That was 3.1% increase from the previous year. The market size of constructing houses will shrink because of aging society, but public building construction will support the construction market. The construction budget of Japanese government in 2018 is about 21 trillion yen. That was one trillion yen decrease from previous year because that of 2017 included the supplementary budget for reconstruction of earthquake in Kumamoto prefecture. However, that will increase or remain flat in the next few years because there are many construction projects for the Tokyo Olympics in 2020. In addition, it is said that the Japanese government will the budget for maintenance and rehabilitation of aging infrastructure. About constructing houses, the number of apartments constructed increased 20 months in a row over the smae perod of the previous year. Many landowners made an apartment on own land for decreasing inheritance tax. The amoount of inheritance tax on a land for apartment is cheaper than that for house in Japan. However, the number of apartments constructed decrease from June 2017 because of concerns about oversupply. Financial Services Agency also alerted banks to the default possibility of apartments loans because many apartments in provincial towns have vacant rooms. About office buildings and commercial facilities, there are many construction and redevelopment projects in Tokyo. In addition, Central Japan Railway Company plans to start operation of the Linear Chuo Shinkansen Line by 2027. The Linear Chuo Shinkansen which is a Maglev train (derived from magnetic levitation train) will be able to run between Tokyo and Nagoya in just 40 minutes. The distance between two cities is 356km(221miles), such as from New York to Boston, from Los Angeles to Las Vegas. There are 470 thousand construction comapanies in Japan, 48 companies among them are major construction companies. These major companies account for 30% of construction market according to the report of the Japan Federation of Construction Contractors. Especially, the five biggest construction comapnies account for 15% of this market. The five companies, Kajima Co, Obayashi Co, Shimizu Co, TAISEI Co and Takenaka Co, are called "Super General Contractor". Kajima Corporation was founded by Iwakichi Kajima who was a a master carpenter in 1840, it celebrates its 180th anniversary in 2020. It is the first construction company as its sales reach one trillion yen, its sales in 2017 is about 1.8 trillion yen. 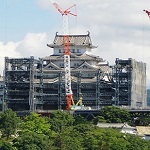 Recently, its restoration of Himeji Castle which is World Heritage Site became a topic and won the prize. Obayashi Corporation was founded by Yoshigoro Obayashi who was born in Osaka. Obayashi has strong foothhold in west area of Japan called Kansai region including Osaka. It also has certain levels of market share and presence in east area of Japan. It is well known as construction company which build the highest tower of Japan Tokyo Sky Tree. Obayashi Corporation is also proactive in using IT for optimization of construction. 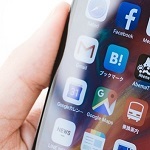 It succeeded in remote control construction with 5G and 3D monitor in cooperation with KDDI(telecommunications operator) and NEC(IT corporation) in 2018. In 2004, the four Japanese construction companies was in the ranking of global construction companies which was based on the amount of sales. However, the only two companies is in this ranking in 2017. Some Chinese construction comapnies rose this ranking. 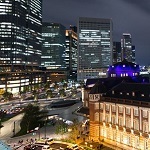 Therefore, Japanese construction companies are proactive in overseas expansion. The total overseas sales of them is about two trillion yen, it reaches a record high. The overseas sales ratio of several comapnies reaches over 20% of of the total sales. Kajima bought Icon corporation and Cockram corporation in Australia, Obayashi bought Kraemer North America. Kajima Co, Obayashi Co, Shimizu Co, TAISEI Co and Takenaka Co are listed on the Tokyo Stock Exchange. Foreign investors can invest in Kajima and Obayashi on NYSE by ADR(American Depositary Receipt). In addition, they can do them through many ETFs, MAXIS Nikkei 225 ETF(NKY), iShares MSCI Japan ETF(EWJ), Wisdomtree Japan Hedged ETF(DXJ) and more.